Note: Two of the dishes I am making for this feast require doing some things “the day before.” This is one of them. 1. The evening before you are planning to make this dish, cut the rind of an orange in long strips. Tip: Lay the orange peel slices skin side down on the cutting board and cut parallel to the board to remove all of the bitter white pith. Stack two or three of the strips and cut them length ways into long matchsticks. Reserve the rest of the orange. 2. Peel a large carrot and use a vegetable shredder to make about a half cup of matchstick carrots. Tip: If you do not have a shredder, continue to use the vegetable peeler to make long, flat carrot strips. Stack two or three of the strips and cut them length ways into long matchsticks. 3. In a small saucepan combine the orange rind with ¾ cup water and bring to a boil. 5. Add ¼ cup of sugar and stir until dissolved. 6. Add the carrot matchsticks and boil for ten minutes. Cover and remove the pot from the heat. 7. Make sure that all of the carrots and peels are submerged in the liquid and let the pot cool and sit overnight. Tip: This process removes much of the orange rind’s bitterness and partially cooks and candies the orange and carrot. 8. Wash the rice until the water runs clear. Tip: “White” rice grains have had their hulls polished off. This process leaves tiny bits of starch dust coating the individual grains of rice. For some dishes you want this loose starch to remain in your dish so that the rice clumps together. For other dishes you want individual grains of rice to be separate and free. For “clumpy” rice only rinse the rice once. For loose grains of rice, rinse the rice thoroughly and pre-cook it in a large quantity of water. 9. Put 4 times as much water in a pot as the rice you are planning to cook. Bring it to a boil and add the rice and a pinch of salt. Cook it about 10 minutes and then strain off the water. Tip: You want the grains soft but not fully cooked. This also removes any remaining excess starch. 10. Drain the carrots and orange peel and reserve. 11. Melt 2 tablespoon of butter in a medium pot with a tight fitting lid. Tip: If you do not have a pot lid that is tight fitting, wrap the lid in a thin towel so that there is cloth between the lid and the pot to form a better seal. Tie the tail ends of the towel up to keep them away from the heat if you are using the kind with a knob handle. If you have a loop handle stick the ends into the loop to keep them out of the way. 12. Mix 4 tablespoons of the partly boiled rice with 2 tablespoons yoghurt and a teaspoon of saffron water. 13. Spread this mixture in a layer over the butter in the bottom of the pot. Note: This layer will form a golden crust, which the hallmark of Persian rice dishes. 14. Sprinkle a few of the carrots and orange peels over the yoghurt rice. 15. Add about a third of the remaining rice to the pot and spread it out into a second layer. 16. Scatter half the remaining carrots and orange peels over the rice and sprinkle 1-2 teaspoons of advieh over them. 17. Add half of the remaining rice to the pot and spread it out into a third layer. 18. Scatter the remaining carrots and orange peels over the rice and sprinkle 1-2 teaspoons of advieh over them. 19. Add the remaining rice to the pot and spread it out into the final layer. 20. Shape the rice into a hill inside the pan. 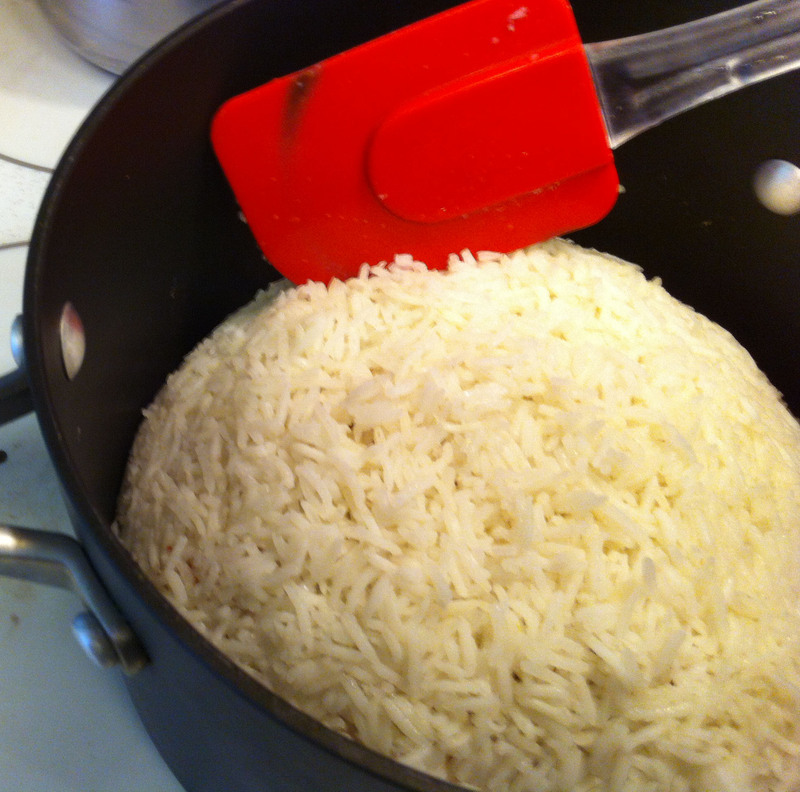 Tip: Push a spatula down along the edge of the pot and gently pulling the top of the rice slightly to the middle. Work around the pot until there is a one inch gap all around the top edge of the pot that tapers out to the bottom. 21. Sprinkle on a tablespoon of advieh and pour the saffron water over the rice. Tip: You do not want spread the saffron water evenly over the rice. Pour it so that some of the rice picks up the yellow saffron color and other areas remain white. Also, be careful not to wash the rice down the sides of the hill. 22. Cover the pot tightly and cook over low heat for about 45 minutes. 23. While the rice is cooking, prepare the garnishes. 24. Thinly slice the onion pole to pole and gently fry it in one tablespoon of butter until soft and well browned. Reserve. 25. In a small skillet toast the almonds and pistachios until fragrant, about 4 minutes. Tip: Do not burn your nuts or the will turn very bitter. 26. Cut the top and bottom off of the orange and lay the cut on a cutting board. 27. Carefully cut the skin off, working around the orange until it is skin free. Tip: You are trying to cut deep enough to expose the membranes between the segments. 28. 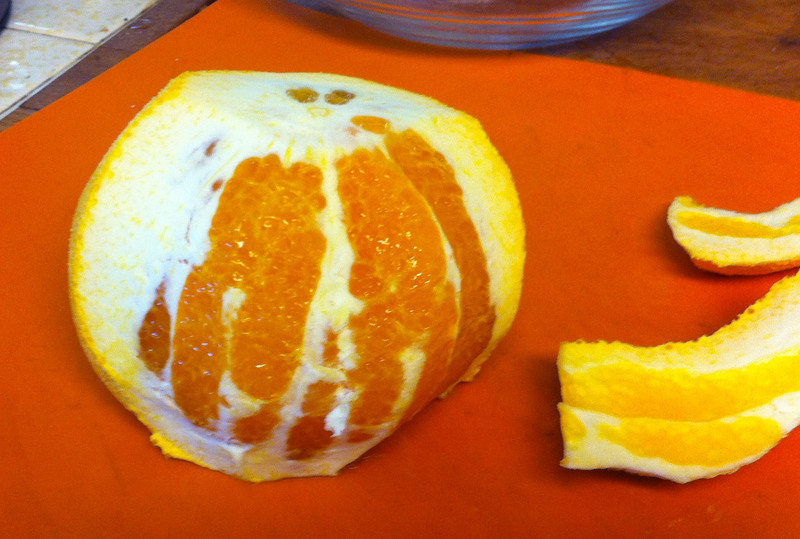 Cut down on both sides of each membrane and remove the orange segments. Tip: This will leave you with a delicate skin free piece of orange. You do not want to handle these segments roughly or they will break apart into an orange mush. 4. Cut the segments in half and put them in a bowl. Drizzle the honey over them and toss very gently to coat the segments. Let them sit for at least 15 minutes. 26. When the rice is done, slide a spatula around the edge of the pot to free the rice from the sides of the pot. 27. Take a large serving platter and lay it on top of the pot. Flip the pot and plate together and set it down on the counter with a rap. Tip: You do not want to set it down so hard that the pot breaks the plate, but if you are lucky the rice will slide free of the pot in one clean mound. 28. Carefully pile the rice in a nicely shaped mound and Sprinkle on some more advieh. 29. 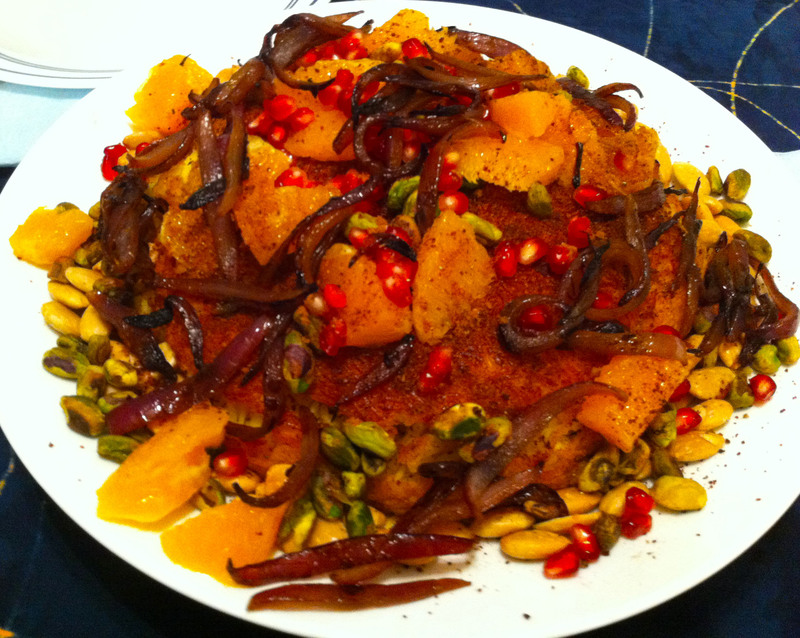 Garnish with the fried onion, nuts, orange segments and pomegranate seeds.